An underground train came off the rails on Sunday and crashed into a wall, seriously injuring the driver. The metro line, which links El-Ataba square near downtown Cairo to the upscale district of Heliopolis, had no passengers at the time of the crash, the company running the metro said. The train was coming out of maintenance on a branch line and crashed while going back on to the main rail. The cost of the crash has yet to be estimated. 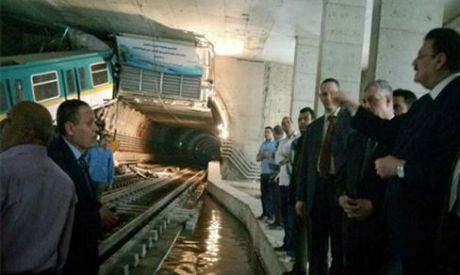 Egypt has been working on launching a new metro line to connect different areas between Cairo and Giza. Sunday's accident was on a newly-launched third metro line. At least 3.5 million people use the metro on a daily basis in Cairo, according to Egypt's State Information Service (SIS). Metro transportation is one of the fastest and cheapest means of transportation in Cairo. A ticket costs LE1, which is equivalent to US13 cents.